The origin of golf is hard to place exactly. Several countries are claiming that they started the now popular game, but the most believed is the Netherlands. According to history, the Netherlands had the ideas of hitting balls into holes with a golf club in the 17th century. In addition to this, it is said that the word golf comes from the Dutch was golf which means stick, club and bat. It does NOT come from the acronym "gentlemen only, ladies forbidden." 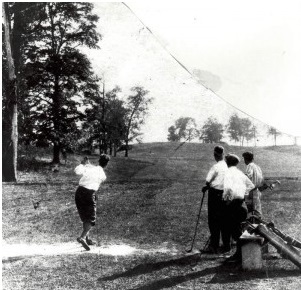 Despite this early introduction of golf, it did not come around in the United States until the 1880s. The oldest course in the world dates back to St. Andrews Trails, located in the Royal Burgh of St. Andrews, Fife, Scotland. This course is known as the "home of golf". Even though it is commonly known that golf courses have eighteen holes, according to history, this has not always been so. Golfers at St. Andrews played on a route that was determined by the topography of the area. An eleven-hole course came about and players would play all eleven, turn around and play them again - twenty-two holes. Some thought that the holes were to short in 1764, so were combined with other holes. The number was reduced from eleven to nine, leaving a total of eighteen holes. The size of the golf hole even goes back in history. The standard golf hole size is 4.25 inches in diameter. It was the St. Andrews Trails that were the founders of this standard size, with some assistance from the links at Musselburgh. This size was decided upon because the folks at Musselburgh had invented the first known hole cutter in 1829. This cutter utilized a tool that was 4.25 inches in diameter. St. Andrews simply liked that size and adopted it for the games standard hole size. The common used phrases in the game of golf are birdie, eagle and par. The word bird was a slang term in the 19th century that referred to anything considered remotely cool. So the term was used then for a great shot in a game of golf - one that led to a score under par - and was eventually turned into birdie. The word eagle followed along those lines in keeping with the bird mentality. Par was used long before it became associated with the game of golf and basically meant something that was acceptable or average. The word simply became associated over time with the game of golf to indicate an ideal score among golfers. Where did these rules come from? Well, you honestly cannot play a game, any game, without rules. So from the very beginning there had to have been understood rules to play along with. No one knows what those rules were as the rules were never officially written until they were specifically written in 1744 for the Annual Challenge for the Edinburgh Silver Club.